As I've said before in previous posts, I much prefer to try different brands and products instead of just sticking to one product and re-buying over and over. I like to have a bit of variety in my make-up bag! The one product I've always a bit of a soft spot for is the L'Oreal Volume Million Lashes. Anyone remember the old advertisement for it with Cheryl then Cole? Well I loved that mascara! I don't think any other mascara has made my lashes look just as full and volumised as this mascara. Well on one of my recent trips to Superdrug I was desperately in need of some new foundation which I actually picked up from the L'Oreal counter (review will be soon!) and since they had an 3 for 2 offer I decided to pick up another tube of the mascara! Perfect! The pictures above really don't do the mascara justice as it volumises my lashes so much that I can actually feel them brushing against my glasses when I blink. That never happens! Normally when I buy mascara, I tend to stick to big, thick bristle brushes as opposed to the smaller comb brushes. I think the comb actually makes my lashes stick together and give that horrible "spider legs" look. Ew! The Million Lashes brush has a multitude of small fine bristles which is meant to help achieve that fanned-out effect without any clumps. And I honestly can't agree more with that. I feel like I'm wearing fake lashes when I look in mirror! Although £9.99 is probably on the higher end of what I'd like to spend on my make-up, I really think this mascara is worth paying that little extra for. I loved it about 5 years ago and I still love it now! 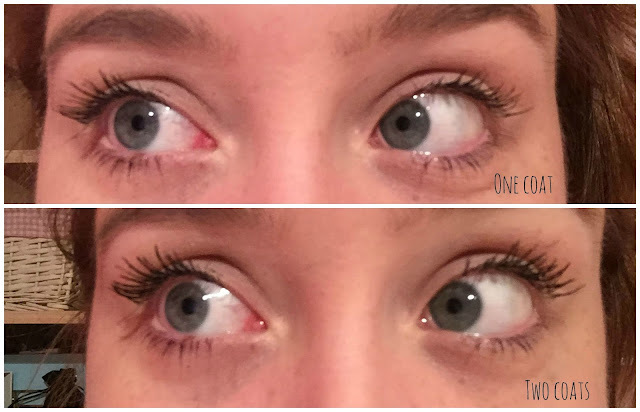 It is definitely that perfect mascara if you want to fake big lashes without the drama. If you fancy giving them a go, you can check it out here on the Superdrug website! looks like an amazing mascara indeed! I've never used any L'oreal ones, and am still loving the lash sensational by Maybelline, but once that finishes, I will be sure to pick this one up! This looks like a great mascara and I did the same thing, I usually go for the big thick brushes. I've just tried the Lash Sensational and I think that has swayed me towards more finer brushes.